Mild climate, Mediterranean vegetation, periodical winds, coastal towns full of fascination and history, villas, parks, castles, churches, monuments, amusement parks, typical cookery with fish and oil of the lake, sport and walking tours: you can find all these things on the lake Garda. The attachment to the land and the its traditions it's expressed in the area of lake Garda through the numerous festivals and recurrences that follow one each other during the year. 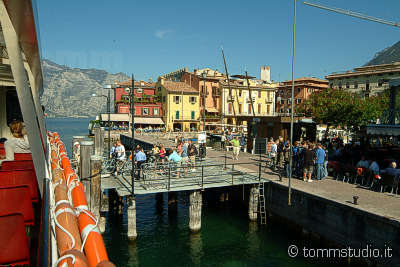 During the summer ..
Lake Garda belongs to three regions, Trentino, Veneto and Lombardy. In the northern part of the lake you can find a more decided and country-style kitchen, while the east side with Verona and the west ..
A complete visit of the lake Garda lead us to the discovery of museums, monuments and religious buildings. The gardesani museums cover all the history periods : from the prehistory and the roman and e .. The Garda has been cradle of civilizations since the prehistory and a privileged way from the plain to the Alps and vice versa. This favoured the crossing of different cultures and civilizations tha ..
On the Garda lake there are many opportunities to practise a sport activity. The lovers of sail and windsurf can find optimal conditions, thanks to the constant winds that blow during all the year; in ..
After sport and activities, visits at the restaurants or hours spent shopping, the body and the spirit need tranquillity and relax: it is the moment to take up the thermal sources of the lake Garda, f ..